At The Reading: This Is Me. I imagine “Who Am I?” is an elemental question almost all of us asks at one time or another. I ask it every day, “who am I?,” and “who do I wish to be?” I have struggled to answer either of those questions in my life. That says something about our town that makes me proud. And the reading yesterday said a number of things about me that made me proud, as well as very proud of my students. It was an emotional experience for me. I was shocked by it. I was surprised at how powerful these words from my students were when read aloud. I could see I was not the only person who felt that way. For five years now, we have poked and prodded each other, laughed and cried today, argued and disagreed. We never stopped loving and trusting one another, we never stopped moving forward. Like exotic flowers, they each took what they wanted, rejected what they didn’t want, planted themselves, and began blooming like beautiful Dahlia’s in mid-summer. I was just astonished by me and by them, which is odd, since we see each other every week. I guess there was a lot of stuff going on beneath the surface. 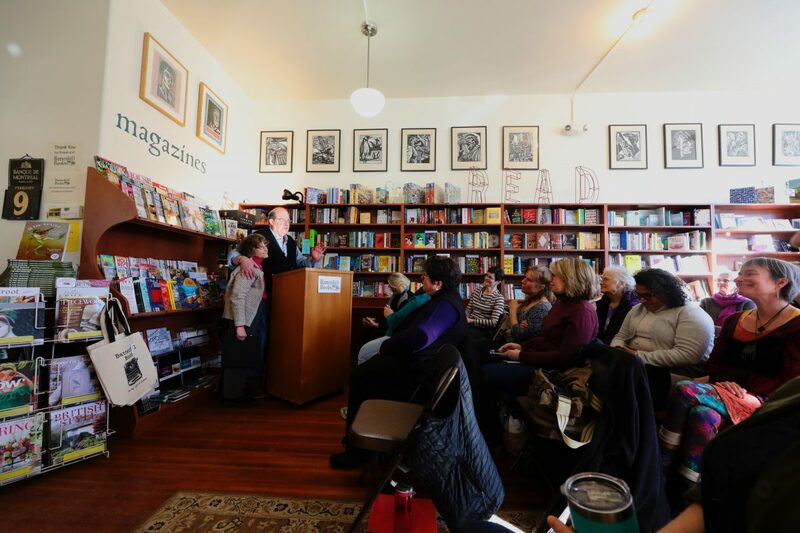 It is one thing to listen and talk to them, another to see in a book store and see and hear them read their work. It awakened me in a stirring way. I got a look at me in ways that i think I needed and that were important to me. I saw a writer who loves his trade and wants to pass on what he knows. I saw an older man who wants to share what he has learned before he turns to dust. I saw a teacher who loves to teach. I saw creative and honest and compassionate people who deserve to have their stories heard, and who have learned to raise their voices and put them out in the world. For me, stories are angels, each sent out into the universe to touch people in one way or another. I saw a person who is learning that he can do good without necessarily being good. I am spared the need or wish to be perfect. I saw a willful man who believes that all of us have important stories to tell, and that there are miraculous new tools and ways to tell them. Sometimes, stubbornness is godliness. With those tools, creative spirits can be free. I saw that all of us are born with the creative spark, and it is a sin to me smother that spark or run from it. Fear, not tyrants, is the great enemy of the writer. You cannot be a good writer without sometimes hurting yourself or the feelings of others. Sometimes, people like to point to the bad things in me, yesterday I saw some of the good things in me. I saw again that good writing is authentic writing, it comes from people who learn to find salvation by never lying to themselves or others. I saw that I have long sought a balance between the spiritual values of humility, suffering, endurance and obedience and the worldly traits of self-reliance, moral value, encouragement and the dignity of human beings. They often collide with one another, discernment is learning to make moral and compassionate choices. I see that I was called to live not from that awful place where I thought of myself as lost and nothing, but from the place of my own rebirth, the place where I can find out who I am and claim my true identity. That’s what I saw yesterday at the readings, as one powerful poem and essay and affirmation after another came pouring out of these good people. They trusted me and honored me by walking together with me to this creative place. Liberating spirituality is rooted in active and persistent and reflective belief, not passive, secret or privileged experience. I have a new motto: Despair But Persevere. I think that’s who I am, and as it happens, that’s who I wish to be.